Valentine's Day at Tampa Bay Area Melting Pot Restaurants! 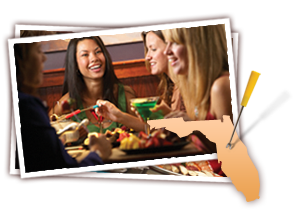 Valentine&apos;s Day at Tampa Bay Area Melting Pot Restaurants! Hello there folks! Jerm here with an exciting Tampa Bay dining update for all of you hopeless romantics out there about Valentine&apos;s Day ! I know what you guys are thinking right now... Valentine&apos;s Day... really Jerm??? Well yes really, and for some of you procrastinators, (like me), you had better go ahead and start making those dinner reservations right now, to avoid the last minute headache! One place to start calling on to make those reservations would be over at the Melting Pot of Tampa Bay! Starting this past Friday, reservations can be made and Club Fondue members, can make reservations as of January 12! sauces and an array of fresh vegetables. marshmallows, pound cake and brownies for dipping. $79 per couple Saturday and Sunday from noon to 3 p.m.
$99 per couple on Monday noon - 3 p.m.
Now if you are a fondue or melting pot newbie like I was, be sure and read my blog from two weeks ago about my experience at The Melting Pot for the first time. Well that&apos;s all for now folks, but be sure you keep checking back this week for more updates on Valentine&apos;s Day related posts. I can also neither confirm nor deny that sometime this week we may even be doing a giveaway for a $100 gift-card for a lucky couple to enjoy V-Day at the Melting pot! Well, again, stay tuned for more info on that and plenty of other Tampa Bay area events related news from the Tampa Bay team!